This is one of my favorites. There is just so much going on here that it immediately pulls you in. Assume for a moment that we all know nothing about this film. Then look at the poster with fresh eyes. Even the casual movie fan knows what a zombie is. But on this poster, they have mohawks, and wear leather jackets! Hell, one even has a padlock thru his ear. This is the first big obvious clue that something new is going on here. Secondly, the humor aspect is addressed in a novel way. How is the title presented? By one of the freshly risen zombies apparently spray-painting it on his own tombstone. A good tagline can also help make a film, and this one presents it in a bold, right in your face font. No screwing about, this film is all about having a good time. Finally, the last aspect I love about it is the background. I feel this is where the horror aspect becomes quite clear. Very subtly presented past the three lead ghouls, who obviously grab a ton of attention, are a host of others. There is nothing funny or humorous about these. The are skeletal, lurking shades in the dark. They are all business and very dangerous. As Burt in the film says "...they'll kill you and eat you if they catch you!" I miss posters like this. They had an original concept, as well as someone sitting down taking the time to draw or paint it, and giving it personality. Small details as the razor blade necklace, or the pins on Mohawk's jacket are great touches. Starting in the late 90's thru the early 00's, we had a run of identical genre posters. Maybe you remember what I mean. The poster would show whatever teenyboppers were hot on UPN or the WB this week, in a silvery river looking smear kind of thing that ran across the poster. This "smear" would sometimes either be superimposed onto something like a knife blade, or have the threat of the film looming over it. For example, take Urban Legend Final Cut, or Halloween Resurrection. Look at those and then see how many other similar posters immediately come to mind. All they were were a paycheck to someone who took Photoshop for Beginners. It showed that the plot, or the monster, or whatever a true genre fan was looking for was an afterthought, as long as "the masses" knew they got to see Neve Campbell at 8 bucks a pop. But I digress. Punk zombies, vandalism, and an offer to party??? Just be sure to send more paramedics. I totally agree. 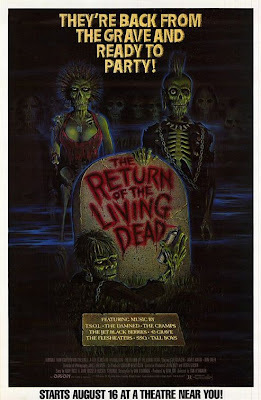 I think "Back from the Grave and Ready to Party" is one of the cleverest and most amusing ad-lines of all time. It really captures the thrust of the movie. But there's more here too. As I write in Horror Films of the 1980s, Return of the Living Dead "ably reflects the punk nihilism of the age" and "the enduring fear of nuclear apocalypse." Don't forget, mail me at my website www.johnkennethmuir.com and send me your pop art suggestions, with reasons why your choice is valuable to you. I'm really enjoying your submissions and want to see more! Amen about the endless parade of bland-o Neve Campbells. Bleh.